We need to talk. I really like fifth edition Dungeons and Dragons. And it’s not just like, it’s like like. Loving a game doesn’t mean there aren’t details I’d like to see changed about it. Today, my friends, we need to talk about the druid. At second level in D&D’s latest edition druids get what has become their signature ability in D&D, known as Wild Shape. Many who read this blog already know the details, but for those who don’t here’s a quick overview of how the ability works in fifth edition D&D. Wild Shape is an awesome ability both flavor-wise and mechanically. It allows a character with levels in the druid class to become an animal. The forms are limited at first, a fish, a wolf, etc. As the druid grows in power, the number of different animal forms one can adopt increases. Certain druids can become mammoths, elementals, and giant scorpions among other beasts. That archetype of druid is called the Circle of the Moon. There is another archetype option for druids who want to be able to cast even more spells than their already on-par with base bards, clerics, sorcerer, and wizard spell progression allows. That is the Circle of the Land. I know no one who is playing a Circle of the Land druid (and I know a lot of D&D players). Why is that? Well, it’s not that the Circle of the Land benefits are bad, they’re actually pretty dope. It’s that the Circle of the Moon benefits are amazingly over-powered and create the greatest tank in the game of D&D. The greatest tank with the spell progression of a wizard. Awesome. This all has to do with Wild Shape. You see when a character uses Wild Shape, he or she basically adopts all the statistics and benefits of the animal into which the druid changes. This seemed like a simple idea which made a ton of sense. It’s very easy for a druid to change into a beast form. The player just needs to see the stat block of the animal and away we go. When the animal form drops to 0 HP, the druid changes back into his or her normal self, basically unscathed. The druid can stay in animal form for an hour or longer, without any concentration check required, so it can carry over a form between battles. It turns out that this allows the druid to soak up tons of damage. A Circle of the Moon druid can become a bear at second level twice before needing to recharge the ability with a mere short rest. 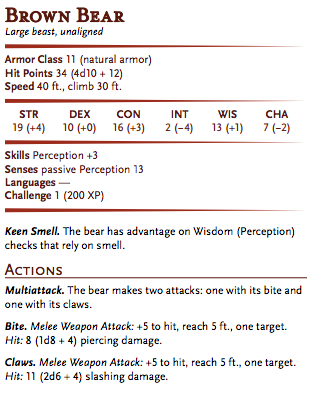 That’s right, a second level Circle of the Moon druid can have all the awesome abilities of being a bear and soak up a bunch of damage two times before having to rest. All that and two attacks to boot! Wow. Look at that HP and those attacks. If you have been following The Tarrasque Takedown, a stress test of fifth edition high level combat, you know the power of a Circle of the Moon druid. Joe Lastowski’s level 20 character had no limit to the number of times a day he could wild shape, and therefore an unlimited pool of hit points. Even in the stomach of the Tarrasque, Malachi Moonriver had no fear of dying. Granted, most druids being played aren’t level 20 and a lot of folks don’t play the final level of their character class that long, but look at the stat block above. You’ll see how powerful a second level a druid can be. Granted a lot of animals also have a low AC and lots of hit points to make up it. I don’t want to be unfair to players who want to be a shape-shifting Circle of the Moon druid. 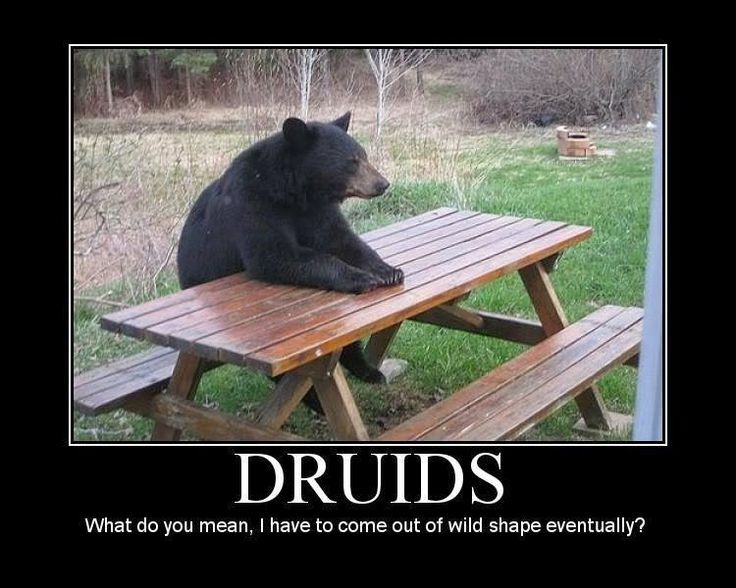 It’s a cool concept, and becoming a bear isn’t something I want to stop, I just think we need to rework the way it’s being done so the druid doesn’t outshine every other class in D&D. 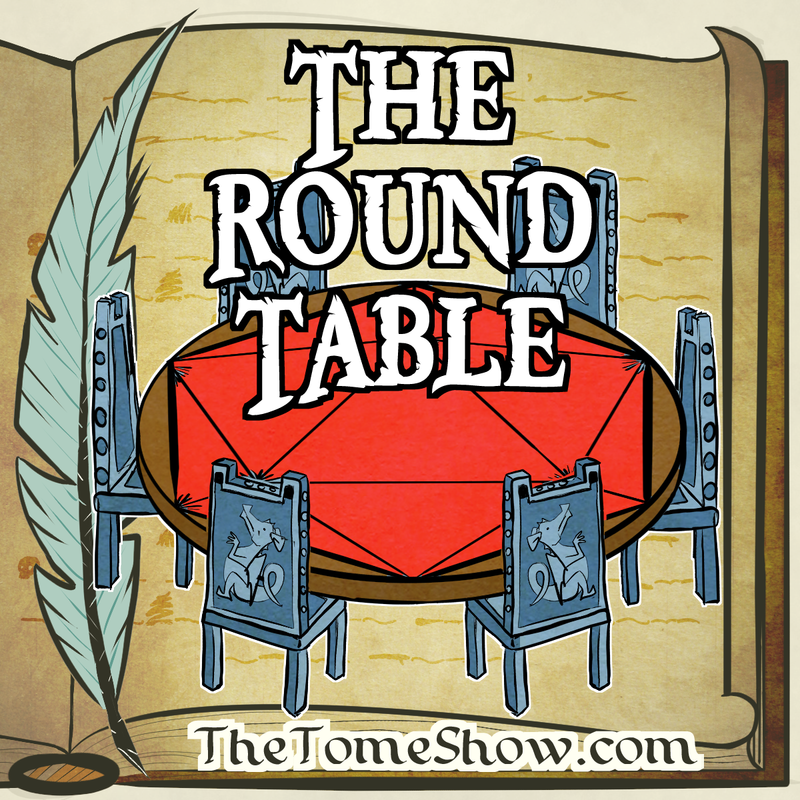 You can hear us discuss some of these ideas on the Round Table Tarrasque Takedown Wrap-Up podcast, which drops on Monday. Also, I want to let you know that Joe Lastowski and Mike Shea will both most-likely be writing about this problem sometime in the future. I have no doubt that eventually you will read Joe’s thoughts at his awesome site, Acts of Geek, and Mike’s thoughts on Sly Flourish, my favorite DM advice site ever. Both are smarter than I and came up with a lot of the thoughts below, so definitely keep checking their sites! Rule Variants, I Choose You! 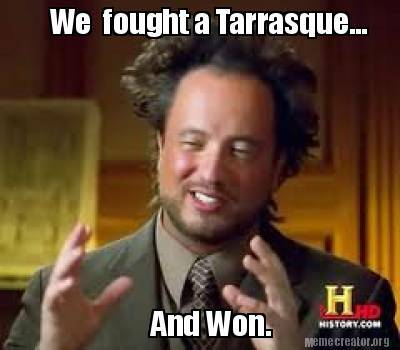 Thanks to the Tarrasque Takedown, Joe Lastowski, Mike Shea, Topher Kohan, Chris Dudley, and I have come up with a few different ideas about different ways to fix (or nerf if you prefer) Wild Shape. Take a look and then vote in the poll below to let us know your favorites (or if you hate them all). We want to hear what you think! Your Wild Shape ability works as normal, except in regard to AC and hit points. You always keep the AC of your normal form. In addition, any damage you takes in a beast form carries over to any new forms you assume and vice versa. So if you take 30 damage as a beast and then revert to your normal form, you have 30 less hit points than before you changed into your beast form. If this damage drops you to less than 0 hit points once Wild Shape ends, you are unconscious and dying or die as applicable. Your Wild Shape ability works as normal, except in regard to AC and hit points. You always keep the AC and hit points of your normal form. If you drop to 0 hit points in a beast form, Wild Shape ends and you are unconscious and dying or die as applicable. Wild Shape works as if you cast a spell which requires concentration. If you lose concentration while in a beast form, you revert back to your normal form and that use of Wild Shape has been expended. Your Wild Shape ability works as normal, except in regard to hit points. Any damage you take in a beast form carries over to any new form you assume and vice versa. If this damage drops you to less than 0 hit points once Wild Shape ends you are unconscious and dying or die as applicable. Each time you change forms, you heal a number of hit points equal to the Constitution modifier of the form into which you are changing multiplied by half your druid level. Your Wild Shape ability works as normal, except in regard to hit points. Any damage you take in a beast form carries over to any new form you assume and vice versa. If this damage drops you to less than 0 hit points once Wild Shape ends, you are unconscious and dying or die as applicable. Each time you change forms, you heal a number of hit points equal to your druid level. Your Wild Shape ability works as normal, except in regards to hit points. Any damage you take in a beast form carries over to any new form you assume and vice versa. If this damage drops you to less than 0 hit points once Wild Shape ends, you are unconscious and dying or die as applicable. Each time you change forms, you gain a number of temporary hit points equal to the Constitution modifier of the form into which you are changing multiplied by half your druid level. When you take damage in a beast form, half of the damage taken applies to your beast form’s hit points, and half the damage taken applies to your normal form. Healing applies in the same way as damage. If your normal form drops to 0 hit points, Wild Shape ends and you are unconscious and dying or dead as applicable. If you have half or less hit points remaining than the hit point maximum of your current form and use Wild Shape to assume a beast form or end it to assume your normal form, that new form only has half of its hit points. Whenever your Wild Shape ability ends, you must make a Wisdom saving throw (DC = 8 + the beast form’s challenge rating). If you fail this saving throw, the DM takes control of your character as its mind is overtaken by the beast into which it has transformed. Your stay in this Wild Shape form with the mind of the beast until lesser restoration or a similar spell is cast upon you. If you die, your body reverts to its normal form. So what do you think of these? Which is your favorite? Do we even need a Wild Shape variant rule? Do you have your own method you like better? Let me know your thoughts!